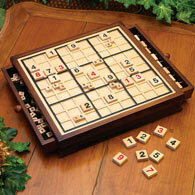 Play the "Game of Four Winds" in either western or traditional Chinese style with our elegant set. 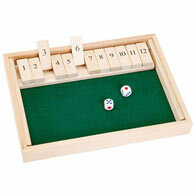 Mahjong is a game that involves skill, strategy, calculation and a degree of chance. Featuring heavy, embossed melamine tiles and dice. Our Mahjong set is perfect for those interested in learning this entertaining game, as well as those who have already played. You can neatly store all the game pieces in the included wooden case when you're done playing. The case is easy to store or take with you if you're on the go. Includes: 166 tiles, 4 colored acrylic racks, 3 dice, 1 bag of coins, 84 numbered sticks and instruction booklet for western and Chinese versions. Velveteen lined handled case measures 8-1/2" x 19-7/8" x 3-3/4". *Sorry, express shipping and gift wrapping not available for Classic Mahjong Game Set.